Two days ago, Sony unveiled their latest products at Mobile World Congress 2014 and they are Xperia Z2, Xperia Z2 tablet, Xperia M2, and Sony SmartWear. Although there has been a leak of information about this on the Internet for few days, it still surprise me that all the rumors were true. Anyway, i'm not really dissapointed as Xperia Z2 is not that much different from Z1. It does have a faster CPU, bigger RAM, and also uses the latest Android release (KitKat), but other than that, it's the same as Z1. I'm more interested to try Xperia Z2 tablet. I already have an iPad, but still it makes me so curious to try out this tablet since i already tasted Xperia Z1 (phone). I wanted to see what kind of experience will i get when playing with the tablet. More over, it uses Kit Kat which brings many new improvements compared to Jelly Beans. Anyway, i just asked Sony Xperia Twitter account about Kit Kat availability for Z1 and they don't have a spesific date set for 4.4 rollout, but based on the answer, i think they already have it ready by now. They are just waiting for the right time to release the update. I hope after the MWC 2014 is over, Z1 users should get this update. So, my best bet will be on March. For the last few days, i have been testing MATE 1.8 RC on a clean VM of Slackware 14.1 and so far, the results were great. No major problems found during quick test and it's well integrated with Slackware 14.1. I would like to give big credit for Patrick Volkerding for giving big support of MSB in Slackware 14.1, so that some of the packages needed in MSB could be integrated in the main tree. I'm still using MATE 1.6 on my laptop and i will try to upgrade to MATE 1.8 as soon as they are released. I never tested on upgrade process, but i believe the risk is so minimum. The MATE developer didn't make an aggressive or massive update to the packages, just incremental updates, which is something i like. I hate BIG CHANGES like what happened with the latest systemd release: systemd 209. It causes lots of problem for downstream (Linux Distributions) as they have to take precautions about the massive changes and make sure that it will not break their product. I'm so lucky that Slackware isn't using systemd (at least until 14.1) and hopefully, we will never have to battle against systemd in the future. Last week, The Document Foundation has released a new major version of LibreOffice suite 4.2, bringing many many changes to the product, ranging from new UI for the start screen (not the splash screen), new formulas in Calc, better performance, removed old and deprecated APIs, and many more. Along with this release, a new tool was introduced and that is Impress Remote for iOS. The Android version has been introduced since 4.1, but for iOS version wasn't available at that time. This morning, i checked Apple AppStore and saw that the app has been approved by Apple and now available in their store. I downloaded it on my iPad and start testing it. You can find the online documentation by following this page : http://hub.libreoffice.org/iosremote or use the step by step tutorial on the app itself. The easiest way to connect is by using the same WIFi network on both devices. Start impress and select Slide Show > Impress Remote. Next start your Impress Remote and start searching for your computer (i tested on my desktop). Try to pair and enter the number showed on your computer on your device and you are now connected. 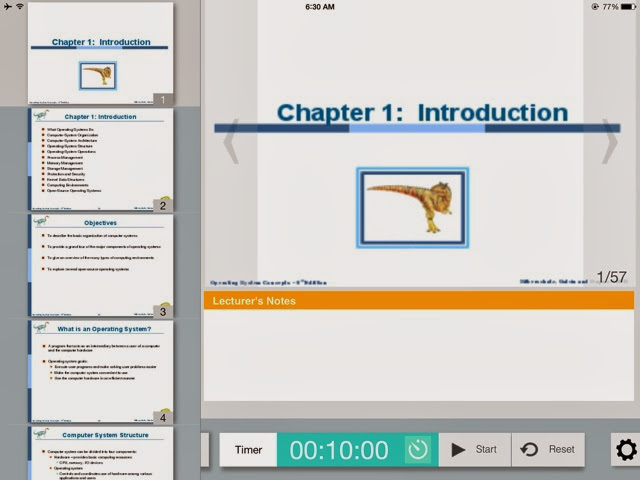 You can start give your presentations using your iPad or iPhone or iPod Touch.